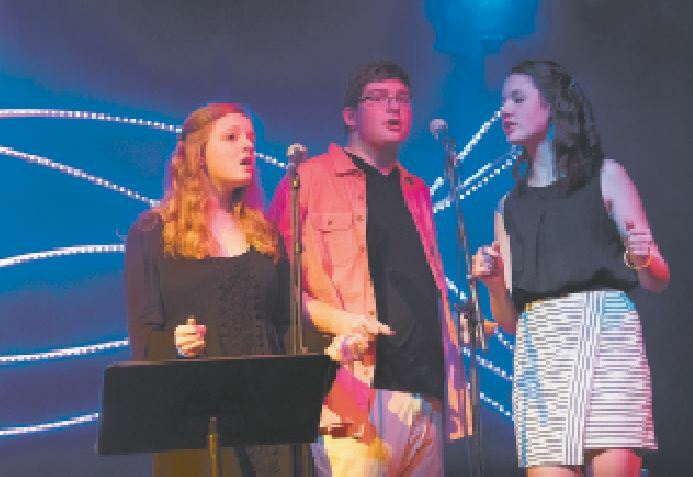 Caroline Pack, Frank Pugh and Nicole Plummer sing backup vocals for Abbey Kotelly on the first night of Guitar Night at Hollis Brookline High School. The HBHS auditorium was alight with neon during this year’s glow party-themed Guitar Night. Hosted by senior Lauren Moura and junior Joey Schunemann, the two-night music extravaganza hosted dozens of acts with musicians from all grade levels. Friday night opened with Abbey Kotelly’s breathtaking jazz vocals on “Midnight Train to Georgia,” backed up by Frank Pugh, Nicole Plummer and Caroline Pack, along with an excellent band consisting of Cam Vahe, Nick Shepard, Peter Szceszynski, Victoria Rezzarday and Ethan King. Midway through the first act, senior Nicky Ouellette brought people onto the dance floor with his acoustic covers of “The Way You Would Love Her” and “Deal.” Then, Will Lindamood and his band kept the rocking vibe going with two face-melting performances of “Back Against the Wall” and “Little Monster.” The first act closed with the faculty band’s cover of “Don’t Forget About Me,” led by choir director Matt Barbosa and featuring physical science teacher Catherine Orzech, physics teacher Eric Perry, math teacher Mark Illingworth and band director Dave Umstead. After intermission, the party resumed with “Binky,” a jazz tune played by the combo band, consisting of Luke Martin, Isaac Wimmer, Nick Franzini, Peter and Steven Szczeszynski, Jack Sinclair, Braid Aiken, Tim Murphey, Andrew Simald and Jamison Muckstadt. Later, Kristi Fox brought her mom (and school nurse) Amber onstage to sing a heartwarming duet, “Willow.” Fox was then joined by Leslie Comeau for a gorgeous rendition of “Somewhere Only We Know,” accompanied by Peter Szczeszynksi and Eric Perry. Frank Pugh and Vivian Provost brought the tempo back up with “Ain’t No Mountain High Enough,” and the first night concluded with three numbers from Isaac Wimmer, Matt Bradshaw, Nick Shepard and Peter Szczeszynski – the finale being marked by Shepard rocking on his drum set so hard that it physically fell apart. Moscatelli and Cochran were later joined by Samantha Randlett, Joe Mesina and Catalanotti for three songs, including an original titled “Soar,” written by Messina himself. The faculty band returned to round out the first act with “Foxy Lady,” complete with a cameo from the legendary English teacher Michael Fox himself. For the remainder of the night, the volume was cranked to its maximum. Perry stepped out from behind his usual location at the drums and belted out his own version of the popular “Crazy Train.” Then, Aaron Velez closed out the night with six numbers, along with Wimmer, Bradshaw, Shepard, Sinclar, Martin, Muckstadt, Szczeszynski and Michael Friedman. If you are interested in participating in future Guitar Nights, you can text @jimmypage to 81010 to receive text updates about audition opportunities.